The Marine Corps League, with out a doubt, has the best looking uniforms of any veteran's organization. Our uniforms, like our counterparts on active duty in the Marine Corps, are practical, well-designed, and display an aura of professionalism. Although there is no requirement for members of our detachment to purchase, maintain, or wear uniforms, members are encouraged to purchase and wear at least a Marine Corps League cover and an authorized cap device to our meetings and events. Remember, the proper wearing of a Marine-related uniform sends a very powerful message to everyone in our community that we, who are Marines, are a very special breed. This section was developed to assist members in understanding the different types of uniforms, specific instructions on how to wear them properly, and how they may be purchased. There are five types of uniforms prescribed for wear by both regular and associate members. Prior to purchasing any uniform items, it is strongly recommended that you take a few minutes to read about these five types of uniforms so that you don't order any unnecessary items. This will also help you in deciding which uniforms you would like to purchase. In addition to the five authorized types of uniforms, we also have an unofficial attire that may be worn to our meetings and other events due to the casual nature of our community. Below is information pertaining to each of these five authorized uniforms and for the unofficial attire previously mentioned. Each section discusses the items which make up the respective uniform, the regulations regarding their proper wear, and photographs of these items. Now that you have become familiar with all of the various uniforms and the regulations for wearing them properly, you'll want to get started in acquiring the various articles and accessories that comprise each full uniform. Whether you buy a few items at a time or all at once, is up to you and your budget. Members are encouraged build up their uniform wardrobe and to wear them with pride at each appropriate occasion. The purpose of this next section is to provide you with the resources for where you can purchase the various uniform articles. Here you will be able to view the websites of various vendors that carry uniform items, and to order directly from them. Keep in mind that you may need to have some items tailored when you receive them such as trousers, blazers and skirts. You will also need to have two patches sewn on the undress white aviator shirts. You'll want to be sure to provide your tailor appropriate instructions for how these should be tailored and sewn on. There are five primary sources for obtaining uniform items for Outer Banks Detachment members. These sources are listed and discussed, below. 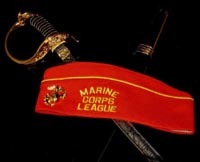 The Marine Corps League Ship's Store: The Ship's Store is stocked with most of the uniform items you'll need. They also carry Marine Corps League and Marine Corps related novelty and gift items. Check out their on-line catalog while you are there. Men's Suits Separates: Men's Suite Separates offers an excellent quality Hardwick scarlet blazer. In support of the Marine Corps League they also offer a special discount, plus free shipping, to members of the Marine Corps League on orders for their scarlet blazer. The Marine Shop: In addition to carrying all uniform items for the U.S. Marine Corps, they also carry Marine Corps League uniform items. Here you will find most of the items needed for the formal uniform such as the scarlet dinner jacket, gold vest and gold cummerbund as well as articles for other uniforms such as the black and dress blue trousers. All uniforms carried by the Marine Shop are of high quality, so expect to pay a little more. SJSews: For Outer Banks Detachment polo shirts and custom embroidery work, our local source is Joanne Sulik, wife of one of our members. Joanne does excellent work and can take care of any custom work for a very reasonable price.